If you are drawn to the beauty of stainless steel, yet are reluctant to sacrifice the cooking efficiency of aluminum, you can now have the very best of both worlds. Triply gives you a mirror polish stainless steel exterior, a heavy gauge conductive aluminum filling, and a stainless steel interior which won't react with foods. The disk is then formed into a pan shape, with walls and bottom of equal thickness, which allows heat to be conducted evenly. Stay cool handles feature an ergonomic design and secure attachment. The versatile size and shape of this pan means you'll use it, well, just about every day. I wanted a stainless steel pan to replace the various brands of coated non-stick skillets I own that seem to scratch and lose their non-stick properties over time despite meticulous care. The Calphalon 12-inch everday pan meets that need and more. Admittedly, before purchase I was skeptical about the non-stick claims made about this pan. If one follows the manufacturer recommendations to preheat the pan before adding food to it, I find that most foods do not stick. Some foods (mainly meats) stick a little, but they clean off readily with soapy water and a soft-scrub sponge. A new-like shine can be maintained with Barkeeper's Friend. If you simply want a skillet, there are many other pans that would work quite well, but what sets this pan apart from those skillets is the high-dome glass lid and short side handles that make it a great brazier. You can prepare tender, thick pork chops that will cut with a fork by putting them in this pan with about 1/2" of water in the bottom, covering with the lid, and baking them in the oven at 325 degrees for a couple of hours. And the pan will come clean easily. The glass domed lid retains moisture in the pan very well, which keeps foods moist and tender during the cooking process. For those who like to fry foods, this pan is a great choice. Unlike coated non-stick pans and skillets, you can cook with as much heat as you want without worrying about damaging the pan. The pan and lid are rated to handle up to 450 degrees. The size of this pan can be a plus or a minus depending upon the amount of food you want to cook. The 10-inch version of this pan, which sells for about $20 less, would probably be sufficient for one or two people cooking small meals. Even though there are only two in our household I find myself using this 12-inch pan, however, instead of a 10-inch skillet because I can cook without worrying about food spilling over and/or make enough for leftovers. It is also a handy size for cooking small roasts with the lid on or off. The pan has nicely tapered edges that make for dripless pouring of liquids from the pan. I use oven mitts to hold the glass lid slightly ajar against the pan to strain liquids. The weight of the lid makes this a little awkward, but it is made easier with the two side handles. A lightweight aluminum splatter cover might work better for this, but I tend to minimize the number of items that I care to wash after cooking by using the lid instead. One handy feature of this pan which is also a negative is the short side handles. They are wonderful for baking things in the oven, and a pan this size would be heavy and awkward to lift with a single long handle (I own a 12-inch non-stick skillet with a handle, and it is very heavy and takes great strength to hold a lid against it to drain off liquids). The downside, though, is the short handles get quite hot with cooking heat above a simmer making usage of potholders or oven mitts a necessity for safe handling. If Calphalon would create handles that could remain cool during cooking, this pan would be perfect. I roasted a 20 lb turkey in it. I recently moved into a new rental with a glass top electric stove. Unfortunately my cheap old stainless pots and pans, which have served me well, are slightly warped these days. It's enough that the pans don't heat evenly on the flat glass top. So, I thought it was time to buy some real cookware. This heats very evenly, and rather quickly as well. I find generally I have to use a lower temperature setting than I'm used too. The size is perfect, and I like that there's side handles instead of long handles. The slopped bottom keeps things from getting caught up in the corners, and the drip edge on the rim works well. 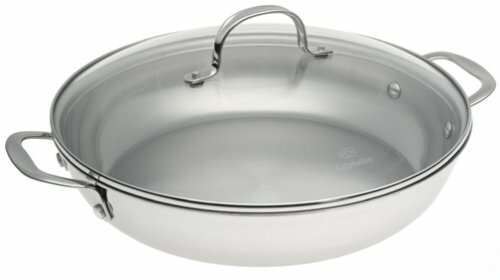 I recently purchased the Calphalon Tri-Ply 12 in Everyday Pan and absolutely love it! I really do use it every day! What a pan! It's a wok. It's a dutch oven. It's really an everyday pan. I do lots of cooking in this pan. I never thought pans made a difference. It's hard to go back to my old revere ware. I like the handles, they don't get in the way like the long ones. It's ok in the dishwasher although the purests say wash it by hand. I'm thinking of the 10 inch version because this one is a little big when cooking for 2. Never makes it back to the cabinet! Since buying this pan about a month ago, I think I've put it in the cabinet exactly once. It's either on the stove or in the sink getting cleaned for the next time. Although I have a large collection of non-stick pans, I'm always finding myself looking for something new to cook in this one. Non-stick pans simply can't compare, especially when it comes to searing meats (mmm steak) and creating sauces and gravies from the great stuff that sticks to the bottom of it. If you're having to clean that stuff up afterwards then you're missing the best part of using this pan! OK, maybe I'm being judgmental, but even if you don't do anything with the "fond" that's on the bottom of the pan, cleanup isn't that hard if you use the right products and methods. You can put some water into it, heat it up and scrape much of the residue off. The rest can be gotten off fairly quickly with an abrasive sponge and "Barkeepers Friend" (the powder not the liquid). One of those little square nylon pan scrapers come in handy too. Yeah it still take a little elbow grease, but from a guy who hates to do dishes and had always dealt with non-stick pans, I'm finding the benefits of this pan far outweigh the problems. I have owned this pan for many years and used it almost daily. It is my favorite kitchen item. We recently moved across country for 6 mons. I neglected to take this pan with me and had to buy another!